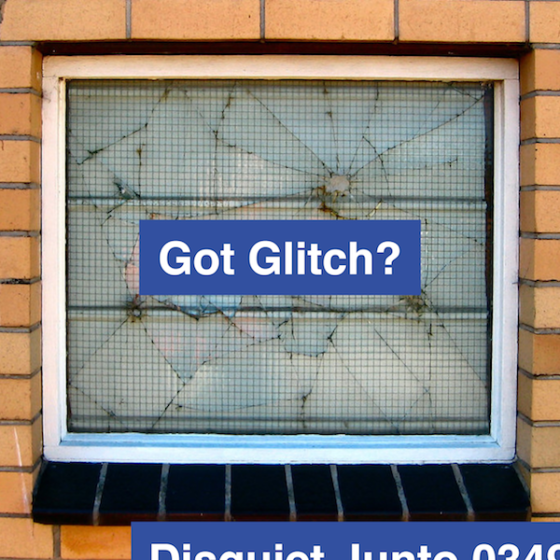 Disquiet Junto Project 0349: Got Glitch? The Assignment: Help define "glitch" by glitching something, and explaining what you did. Deadline: This project’s deadline is Monday, September 10, 2018, at 11:59pm (that is, just before midnight) wherever you are on. It was posted in the early evening, Oregon time, on Thursday, September 6, 2018. The Assignment: Help define “glitch” by glitching something, and explaining what you did. Major thanks to Sevenisn, Mark Lentczner, and other folks in the Junto Slack for pitching in on this project’s development. Step 1: Consider what “glitch” means in music/sound. Step 2: Make a piece of music employing a glitch that arose from your thinking in Step 1. Step 1: Include “disquiet0349” (no spaces or quotation marks) in the name of your track. Step 2: If your audio-hosting platform allows for tags, be sure to also include the project tag “disquiet0349” (no spaces or quotation marks). If you’re posting on SoundCloud in particular, this is essential to subsequent location of tracks for the creation a project playlist. Title/Tag: When posting your track, please include “disquiet0349” in the title of the track, and where applicable (on SoundCloud, for example) as a tag.